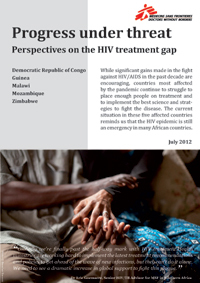 While gains made in the fight against HIV/AIDS in the past decade are encouraging, countries most affected by the pandemic continue to struggle to place enough people on treatment and implement the best science and strategies to fight the disease. While significant gains made in the fight against HIV/AIDS in the past decade are encouraging, countries most affected by the pandemic continue to struggle to place enough people on treatment and to implement the best science and strategies to fight the disease. The current situation in Democratic Republic of Congo, Guinea, Malawi, Mozambique, and Zimbabwe reminds us that the HIV epidemic is still an emergency in many African countries.